And I know exactly what it is… I want every person to win. I want Russia to continue dominating gymnastics, USA to upset and Botswana to come out of nowhere. I want an impossible scenario. Athletes spend 4 years training for this ONE event, 4 years training to land on their head 5 seconds into the performance. There’s something fantastic about the athletes, picked as the champions of their respective countries, an offering unto the Greek Gods. Most of them know that they will be mere sacrifices at the gathering yet, compete anyways, taking crushed dreams with them as they make their exit only moments into the qualifying rounds. They know they won’t win yet have such hope that they will. You see it in their faces when they line up for their race or tumbling pass. This is where I surprise everyone. And I believe them, dammit. I see that look and I think in turn. They’re going to do it! I SHALL WITNESS! Then they lose. They always lose. And I cry very, very manly tears. I blink through them just long enough to see the heavily favored American approach. Well at least they won’t blow it. Right? RIGHT?! McKayla Maroney. Please. Oh please. Just land on your feet. The announcer said that’s all you needed to do. Can you hear the announcer? Land on your feet! And as you know, I cried some more. But…they said you are the best…. Jordyn Wieber did not qualify for the all-around and I fantasized about punching judges for stupid rules (How can you call something a final when some of the best athletes are omitted?). What twists the dagger in my heart is that for a majority of these “sports” (I’m being generous with you trampoliners), this is their chance at fame. No one cares about even The Michael Phelps between Olympics (unless he smokes some weed and gets munchies for Subway). We care about him only slighty afterwards, and only because he won. And he is the most decorated Olympian this world has ever known. Imagine the obscurity of athletes from less popular events. And NO ONE remembers losers. You “won” Bronze or Silver? No, you lost Gold. Way to go loser, no one cares. Play your anthem while you stand on the podium? Yeah…. right. Be happy we even gave you a $41 trinket. My cowardly brain does not comprehend this sacrifice of effort. Why in the hell would Nigeria even show up to play Team USA in basketball? The game was decided before it began. My 10 month old daughter even giggled at the matchup (she also pooed, but I believe that to be unrelated coincidence). 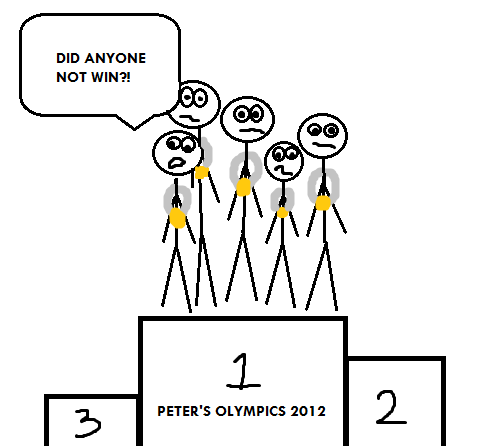 I could go on and on about the unfairness of the Olympics in its fairness— if that makes any sense— but I won’t. I won’t talk about how unfair it is that 15-year-old girls get their dreams crushed and how being .01 second behind Michael Phelps makes you slow. Just wait. I’ll be back in four years and surprise you all. And with a broken heart, I’ll root for them again. This entry was posted in Blogging, Funnies, Writing and tagged blogging, crying, humor, london 2012, losing, mckayla maroney, olympics, team usa, writing. Bookmark the permalink. Yes I am always an underdog man myself. Makes you wonder why we choose to torture ourselves like this… But I guess it’s worth it when just that once, they pull through. The reason I love the olympics, is that they truly are all winners. To get to the olympics, and represent your country, means that you are the best. It is a competition of the best of the best. There are no “losers” at the olympics. But thats my point. Look at McKayla Maroney, devastated because she got Silver. She feels so terrible yet has no idea the magnitude of her accomplishment. I’d love to be second best at anything. Years later she’ll realise what she’s achieved. I think her disappointment has to do with all those sweet endorsement deals she missed out on. I’m inclined to disagree – what about that Saudi woman who ran the embarrassingly slow time in the 800 meters. You cannot tell me there are 100s, maybe 1000s of women in the world who could runt hat time better than here yet they were not allowed to compete because each country (except the host nation) has a quota. Is that the best of the best? See, despite my vehemence at the rule preventing Jordyn Wieber from competing in the all-around, I’m okay with those women not competing. If you can’t beat the best in your country, get out the kitchen. I am aware of my double standard, yet I stand by it with unreasoning pride. I think they spend more than 4 years training for the Olympics 🙂 What has been suggested at my work is we would like to see is some kind of dodge ball battle royale at the end between all the gold medal winners to find a kind of ultimate champion.